I decided I needed to make a few more moves. The Prizm mini-master set, Sarita super collection, and a few other things are taking up my attention and I don’t see myself getting around to any of these things anytime soon. • Dock Ellis, Felix Hernandez, Monte Irvin, Andrew McCutchen, Anquan Boldin, Kobe Bryant, and Lolo Jones are officially removed from the collection, though I may keep a little of the little I have of each of them. • 2012 and 2013 Bowman Silver Ice, 2012 Golden Moments Die-Cuts, 2012 Finest Faces of the Franchise (most are still on COMC, they’ll be available for trade once I have them shipped), 2013 Topps Emerald parallels, and 2012 Topps football Mini Tall Boys are removed from Single Page Sensations. A couple others are on the bubble. • Everything I removed from the Single Page Sensations page in this round of cuts that I’m not keeping are now on the trade bait page. Everything I am keeping went to the miscellaneous collection page. • The only additions I’m making are probably putting Starlin Castro back as a full, if super halfhearted, collection and strongly considering a Kerry Wood Single Page Sensation page. 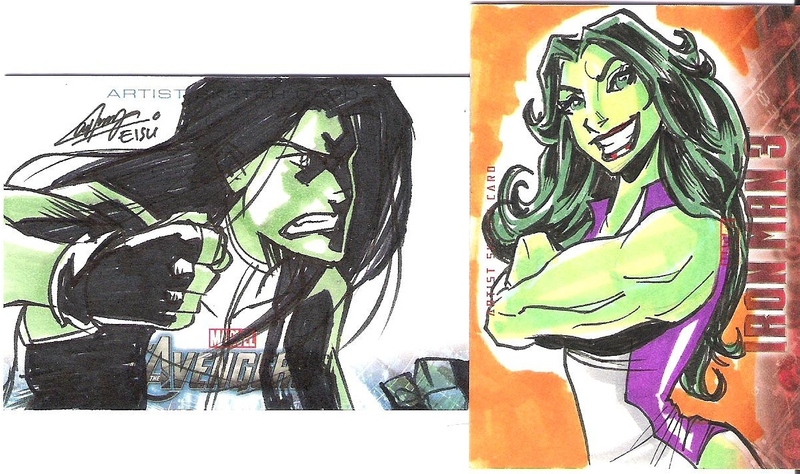 Shulkie sketch cards by two of my favorite artists via the Blowout forums..